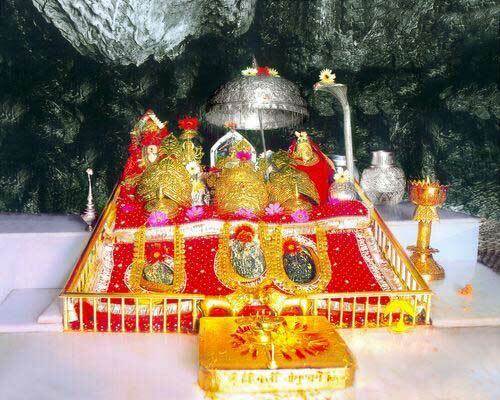 There are numerous stories associated with Mata Vaishno Devi. One of the stories is that of Vaishno Devi meeting Sri Ram as a child. The popular belief is that Mata was born to a childless couple in South India after several years of penance. The couple while praying to Mother Goddess had promised that they would fulfil all the wishes of the child. A baby girl child was born to the childless couple and she was named Trikuta. From a very young age, Trikuta showed high spiritual inclination and was an ardent devotee of Srihari Vishnu. When she reached adulthood, she asked her parents’ permission to meditate by the sea. During this period, Sri Ram was searching for Mata Sita and He reached the seashore where Trikuta was meditating. Vaishnavi told Sri Ram that she had already chosen Him as her husband. Sri Ram told her that He was already married and therefore could not marry. Sri Ram could not ignore the austerities undertaken by Trikuta and promised her that He will marry her in Kaliyuga. He also said she would be known as Vaishno Devi in Kaliyuga.